PacerPro is a powerful Pacer portal for federal litigators. It’s also one of my best tricks to find sample complaints, responses to motions for summary judgment, and other pleadings once you’ve identified the defendants you’re going to sue. PacerPro is a website that lets you access Pacer data in a much more efficient way. Most of their features are free, including the stuff that we need: (1) powerful searching and (2) free access to documents that have already been downloaded into Pacer (docs that haven’t already been downloaded are charged at the Pacer rate). 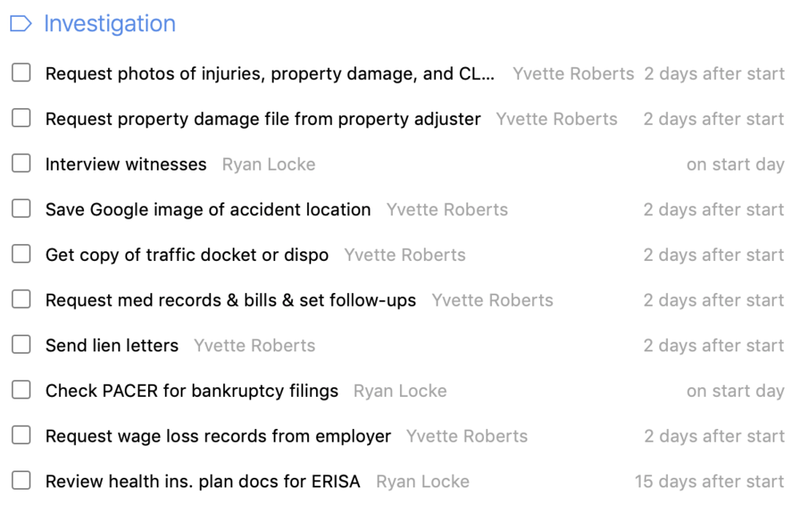 Cliking on “Pacer Case Locator” brings you to a stripped-down screen with only two search options: litigant and date range. Let’s say you have a client whose house burned down because the propane tank on their portable gas grill exploded. The tank was filled bty AmeriGas, the largest propane company in America. We want to search every federal court in the United States for cases involving Amerigas. Put “amerigas” as the litigant (we’re using the shortest possible name for the litigant so the search will return any company with the name Amerigas—this way the search will include subsidiaries) and a date range of roughly ten years. This search returns 213 results and gives us some analysis right off the bat. We’re presented with a map of the US showing where these cases were filed, a pie graph showing the type of cases filed, and a timeline showing the frequency of cases filed. Now the fun part. Click on a case name to bring up the docket. I picked the second case, Cruz et al v. Weber-Stephen Products LLC because it probably involves a Weber grill. Clicking on the complaint entry brings up a box on the right-hand side with the text of that entry and the uploaded documents. You’ll see that the main document is labeled “now available” and “free”—that’s because I downloaded it last night. Any documents that are downloaded through PacerPro—whether by you or someone else—are available free to everyone. No one has downloaded the attachment, so I’d still have to pay Pacer fees to see that. If you click on multiple docket entries, they stack on the right hand side. Then you can select which documents you want and download them as a batch For example, if there are three amended complaints and you want to look at all of them, or you want to see the complaint and the MSJ and the response. You get to batch download twice a month on the free plan and unlimited on the paid plan. And it matches our case facts! This guy was using a Weber grill when the gas leaked out of the tank and exploded, injuring him. (For people with sharp eyes: Yes, Airgas is not a party. They get added later in a third-party complaint). We use a program called Daylite to manage the firm’s cases. Daylite includes a project management component that will automatically create tasks when a project moves from one stage to the next in a pipeline. We use a different pipeline for each different type of case (direct appeal, habeas, personal injury auto, personal injury premises, etc). Daylite will also let you create “activity sets,” which are essentially just groups of tasks that can be created within a project all at once. We use activity sets for things that we know will happen in a case, but we’re not sure exactly when. For example, in a litigation case we know the other side will send us discovery requests, but that could be with their answer or a month later, or a second set of request sometime even later. 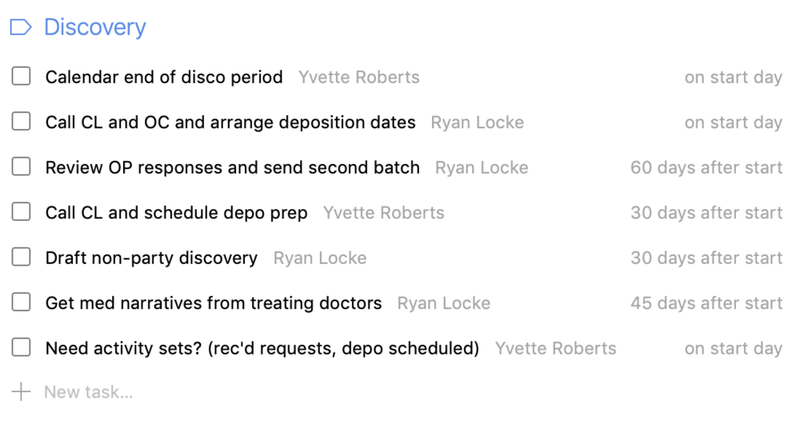 So when we receive discovery requests, we apply an activity set to the project that tasks us to send copies of the requests to the client, draft responses, review the responses with the client, etc. Each task’s due date is automatically set—sending the requests to the client happens on day 0, setting up a client meeting is due day 8, drafting is due day 15, and so on. You can also have activity sets count backward from a date. One way we use “backwards” activity sets is for depositions. For example, once we have a date set for our client’s deposition, we apply the activity set and it sets tasks counting backwards: two days before confirm with opposing counsel and court reporter, seven days before prepare depo outline, ten days before order a court reporter, fifteen days before schedule a prep session with the client, etc. You’ll notice that some pipeline stages are sparse. This is because (1) rarely use these stages—like we rarely file summary judgment motion in auto cases—or (2) there are external factors that will prompt us to do something, like receiving an email or something gets filed or (3) the tasks mostly involve Ryan, like preparing for trial. We’ve tried to strike a balance between having tasks for stuff that easily falls through the cracks or gets pushed off, but not overwhelm ourselves with hundreds of tasks. Ryan has a more extensive trial checklist that he uses to prepare (make sure tech works, visit courtroom if we haven’t been there before, confirm witness subpoenas, load up the car, buy granola bars, etc), but it doesn’t have to be in Daylite because once we at the final trial prep stage it’s the most important thing we’re doing. We’re more likely to forget to send an ERISA letter than forget to create a trial binder. One area we don’t task out is client contact because I schedule time on my calendar to call clients (I like to talk to new clients once a week for the first month, and my paralegal will talk to them every few days as she sets up their case; we also talk to all clients at least once a month when we review all our cases). I’d love to see examples of other lawyer workflows, and I’m happy to hear about how to improve mine. Send me an email (Ryan@TheLockeFirm.com) and if I like it I’ll post it here.